Hello friends! I make new car for my town Prototype Views In cart can sit one... ...two... ...or three minifigs! 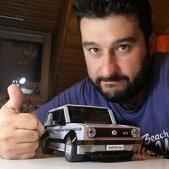 Scale With minifigure With other proportional vehicle of my town I'm waiting your comments. Labaznik, from Russia.